Typical Entertainment has confirmed that Thunder Rally is coming to Switch. A release date has not yet been announced. Typical Entertainment’s developer describes the game as “a chaotic demolition derby party game with crazy physics and nonstop explosions.” We have more details and a trailer below. 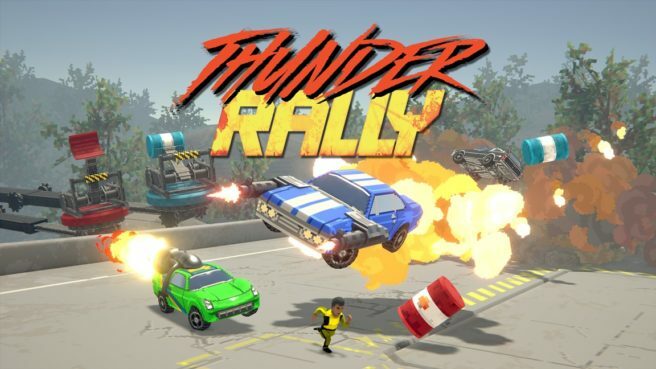 Thunder Rally is a chaotic demolition derby party game with crazy physics and nonstop explosions. Knock your enemies out of their cars and run them over, use outrageous power-ups, avoid hazardous environments, and dodge the explosive barrels launched by your fallen foes. With up to eight local players, the rounds are quick, violent, and usually comical with powerups and stage hazards taking cars and drivers out quickly. As soon as a driver dies, he or she returns as a catapult loaded with explosive barrels. This keeps the gameplay quick, keeps all players involved throughout a match, and continually ramps up the insanity each round. •	Local versus party game for up to eight players. •	Add up to 8 ruthless CPUs for single player versus. •	For fans of driving games, vehicle combat, and crazy physics. •	Made by current and former employees of The VOID.